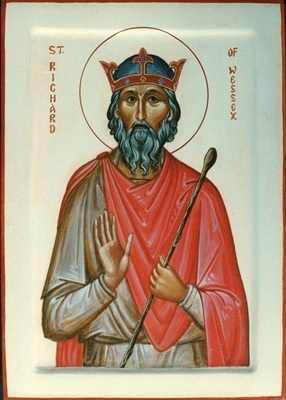 Saint Richard, King of Wessex. Saint Richard the Pilgrim (also St Richard of Wessex, St. Richard the King, St. Richard the Saxon, St. Richard of Swabia) is a saint of the Christian Church. He was born in Wessex, England. He was the brother-in-law of Saint Boniface (Archbishop of Mainz) and father of Saints Willibald (Bishop of Eichstätt), Winnebald or Winibald (Abbot of Heidenheim), and Walburga (Abbess of Heidenheim). Richard, his supposed wife Wuna and their three children are depicted together at St Walburga's shrine in Eichstätt. Richard is said to have obtained the recovery of his grievously sick three-year-old younger son Willibald through his prayers. Richard renounced his royal estate and set sail with his two sons from Hamblehaven near Southampton about 721. They landed in France and stayed for a while in Rouen before setting off on the pilgrimage route to Italy, making devotions at most of the shrines on the way. He fell ill with a fever and died in Lucca, in Tuscany, where he was buried in the church of San Frediano (founded by the Irish monk Frigidian). Miracles were reported at his tomb and a cult of veneration grew up. The people of Lucca embellished accounts of his life, describing him as a prince of the English; another unreliable story described him as the Duke of Swabia in Germany.